Minimum Quantity for Packaging is 1000! 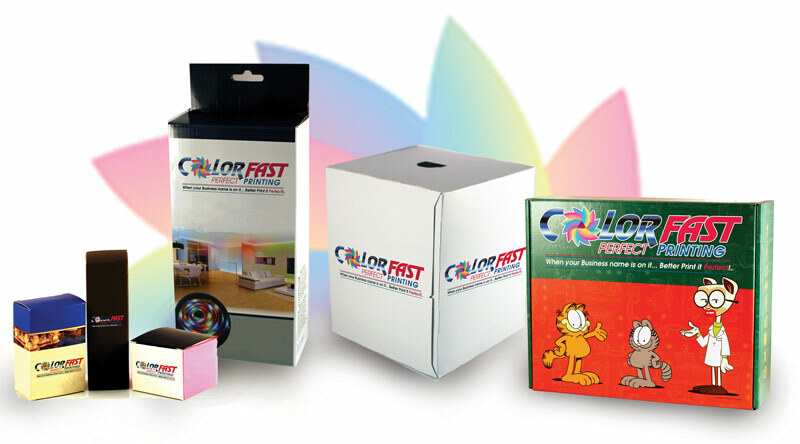 Colorfast Perfect Printing is a Tampa product packaging design company that manufactures custom printed folding cartons for customers not only in Tampa, but all over central Florida. We make your products stand out from the competition with high-quality custom boxes that convey your brand image. Our custom packaging solutions help build your brand loyalty, improving your bottom line. We can create as few as 1000* pieces up to 100,000 pieces. Whether you are reaching out to customers directly or through a supply chain, your product’s packaging needs to capture attention, establish trust, and increase profits. Packaging can be a factor in whether or not you will achieve your sales targets. At Colorfast Perfect Printing, our goal is simple: get your products noticed without breaking your budget. We specialize in short run, custom retail box packaging. Partner with us to convey your brand message to customers; a message that makes them choose you over the competition. We create custom product packing for all types of businesses, such as food and beverage, cosmetics, gifts, medical devices, and more. In any competitive market, differentiation is what separates great companies from good ones. Colorfast Perfect Printing specializes in unique, custom finishes for product packaging. Your packaging will not only stand out for its high-quality design, but also for the signature finish that can take your branding to the next level. Even more important, our custom finishes fit within your budget, especially when considering the expected return on investment. Custom finishes transform the perceived value of your products in the eyes of customers, enabling you to sell more, recoup your investment quickly, and achieve both short and long-term goals without significant changes to your operations. At Colorfast Perfect Printing, we understand that no two products are the same. So, why use the same packaging for different products? The key to winning in the competitive retail industry is to stand out. We work with your company to understand the brand message you want your products to portray. From there, our designers come up with eye-catching packaging designs that will entice your target market and invite them to take a closer look. With spot coatings, specialty UV coating, embossing, metallic foils, and so on – these finishes bring the dazzle to your packaging. Colorfast Perfect Printing takes pride in providing original, unique, custom packaging solutions in Tampa and around central Florida. We work closely with you to capture your idea for the product packaging and create the exact custom printed box you envisioned. We are a full-service product packaging company located in the tampa area with in-house designers, art directors, and retail marketing experts. Our team will consult with you on the design and development phase, capture your packaging imagination, and bring it to life. Give your products an extra edge and get them into the hands of customers. Contact us at 727-531-9506 to find out more about all of our packaging solutions.